Writers need to be warm to work and to have comfortable spaces where distractions are minimized. They also need to get good exercise and nutrition, and refill the well with conversations and local diversions. Preparing the retreat for successful residencies means anticipating those needs and cultivating the resources and community to help meet them. Formally, the retreat operates on the Buddhist principle of dāna which is the practice of cultivating generosity. It begins with the premise that each of us is earnestly trying to contribute something of value and equally interested in receiving abundance in our own lives. For me, it’s a blessing to be in the company of other writers and I am happy to contribute the space. In the short time I’ve been living this way, the difference is obvious. Unexpected resources appear even amidst the inevitable setbacks. 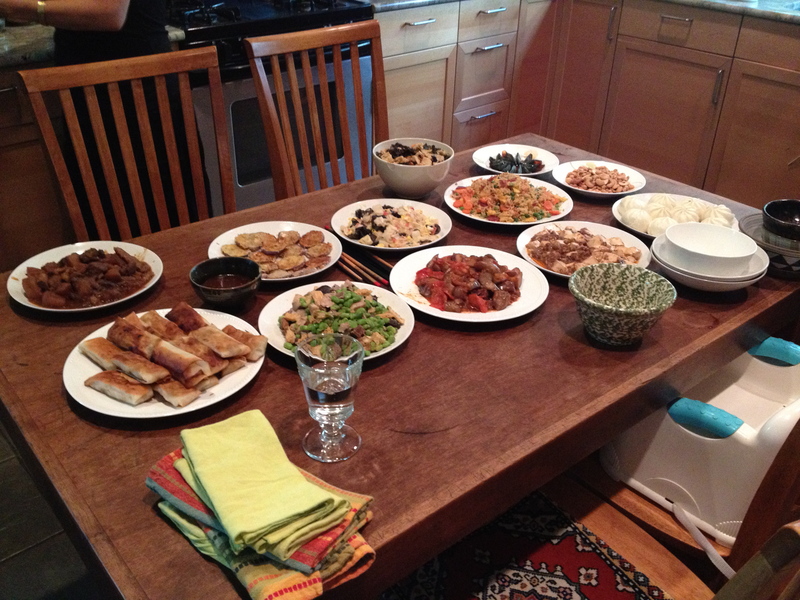 A lovely dinner prepared by Xinxin Wang. Visionary choreographer Liz Lerman said, “Art is big. Dance is big. Nothing is too small to notice.” As writers, we know that great gifts come in the blink of an eye or a shift in perspective. The contributions of those listed here are felt in practical terms and also in the untold ways that matter most. The wish list below is updated regularly with the practical necessities that are just beyond reach. To drop off an item, contact Anne directly. If you want to help toward purchasing an item, consider making a contribution through PayPal. I am always contemplating larger projects that improve the efficiency of the house or add new feature. Call or send a note if your interests match these goals or you have a resource to exchange.